You want to have a rainbow wedding, but without the unicorns. You got this! Couples can show their colorful personalities and keep it classy. We’ve seen it done successfully from the flowers to the food to the favors. Let your invitations set the tone—or should we say tones—for what’s to come. We love the contrast of the colorful hearts against the simple Kraft paper in the photo above. Or print the elements of your invites on different color stationery…red envelope, yellow invitation, blue response card, etc. Your sister looks awful in red, yet shades of crimson completely flatter your best friend. With a rainbow theme, bridesmaids have more than one choice and, for once, everyone is happy. Go with a subtle approach—think sashes or bouquets—or turn the color up full blast with dresses and shoes in assorted colors. Match the bridesmaids to their groomsmen with coordinating socks, bowties or boutonnieres. 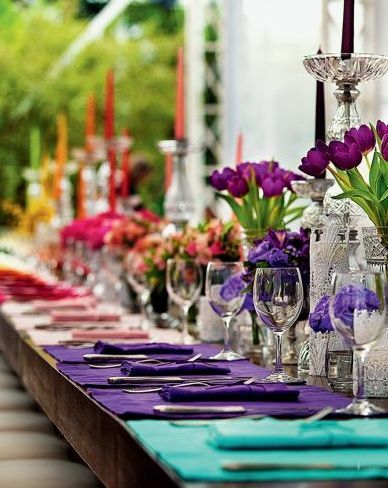 Bring your rainbow theme to the table through the linens, napkin rings and centerpieces. Vintage glassware, lanterns and candles also do the trick. You can achieve tablescapes in a number of styles, from artsy to bohemian to whimsical. Let them eat rainbow cake. After the bride and groom, the cake is the next biggest star at the wedding—and today’s couples are passing up on traditional white buttercream. Play up your theme with multi-colored tiers, sprinkles or ribbons. For the element of surprise, make it a classic white cake with a rainbow’s worth of layers hidden inside. Here’s a tasty twist: a rainbow macaroon tree. Why are there so many songs about rainbows? Simple: They are romantic. Somewhere Over the Rainbow is among the most popular first dance songs of all time, and there are many lovely recordings, from Judy Garland’s 1939 hit to instrumental arrangements such as this one by Makoto Ozone. Here are more ideas for your rainbow playlist. As alternatives to drinking and dancing, many couples are entertaining guests with games and activities. For a dramatic and modern take on the photobooth, create the rainbow effect with layers upon layers of ribbon. Or set up a coloring station as a fun icebreaker. You can frame your favorite photos or mini-masterpieces and display them in your home. Do your guests a real favor and send them home with something cooler than a candle. 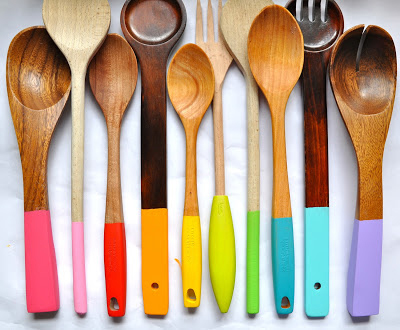 These DIY hand-dipped wooden spoons are as beautiful as they are useful, which guarantees they will be appreciated for years to come. Finally, if anyone accuses you of being indecisive for not sticking to a simpler color scheme, tell them rainbows are a symbol of promise as well as a sign of interconnection in Chinese legend—two beautiful sentiments for a wedding day!